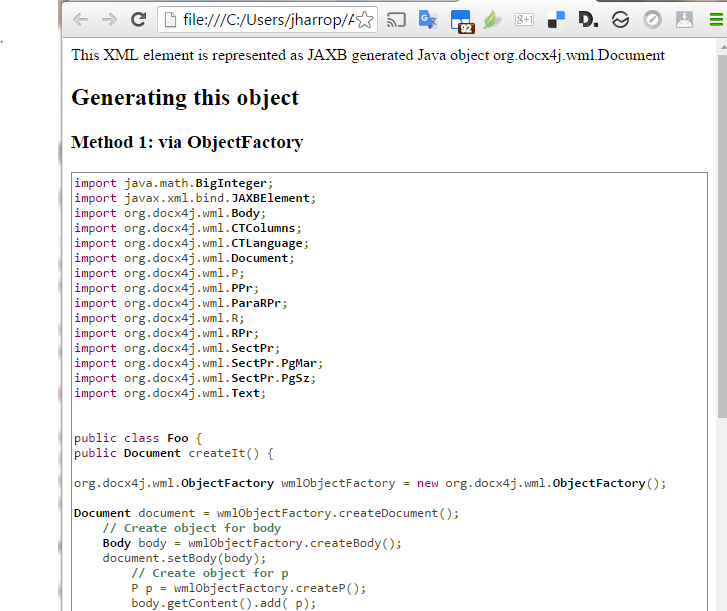 I was looking for a way to convert swagger2markup markdown output to docx using Java (as opposed to Pandoc). Java Markdown parser with source level AST. CommonMark 0.28, emulation of: pegdown, kramdown, markdown.pl, MultiMarkdown. With HTML to MD, MD to PDF, MD to DOCX conversion modules. Its MD to DOCX is in flexmark-docx-converter module, which happily, uses docx4j under the covers. I tried it, and found it works nicely, the exception being table rendering if you open the resulting docx in LibreOffice (Word automatically sets the column widths, but in LibreOffice 5.3 Writer, the column widths are bad and painful to fix). The underlying issue is that markdown doesn’t specify column widths, and in docx4j, we don’t provide an algorithm to help the user set sensible values. Word does not handle inserted HTML very well. Current 3.3.x Docx4j works with WebSphere versions 8.5.5.9 and 9.0.0.5 in WebSphere’s default configuration (tested with IBM Java 8, which is not the default in WebSphere 8.5.5.9). docx4j 3.3.7 contains an important fix for errorsCount where XLXP2 is in use with fallback JAXBContext of Sun/Oracle or reference implementation (see below for context). IBM has their own proprietary JAXB implementation. By default, WebSphere uses com.ibm.xml.xlxp2.jaxb, which has the concept of fallback/ MarshallerProxy. The actual implementation it uses is in com.ibm.jaxb.tools.jar. 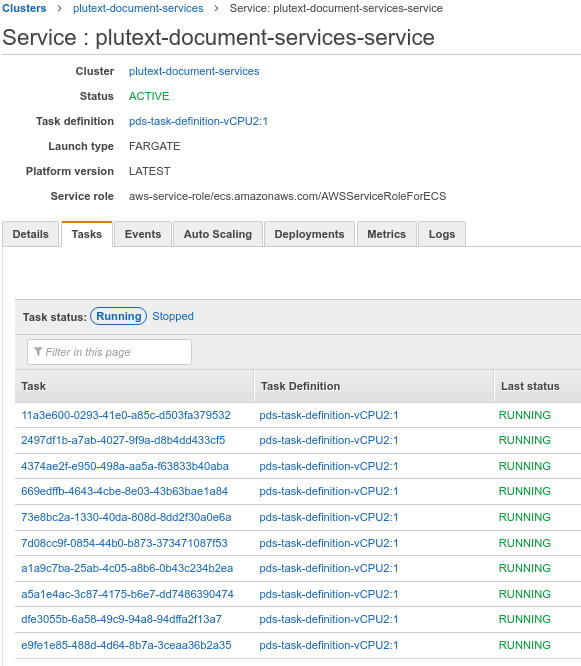 It is possible to configure WebSphere to instead use the JAXB implementation in the Sun/Oracle JRE, but usually you would not do this if you are using the IBM JDK. Alternatively, your application could use MOXy JAXB (by including the relevant jars). At level=3 (default), both unmarshalling and marshalling optimization methods are enabled. In our testing, we used values 0 and 3 (or not set). 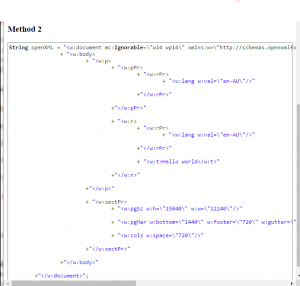 WebSphere has several other JAXB related properties which we left at their default settings. Docx4j contains a class JaxbValidationEventHandler, which is responsible for handling unexpected content (both mc:AlternateContent which is common, and certain other errors in an incoming docx). Some time around 2015, JAXB was changed so that after unexpected content has been encountered 10 times (ie in 10 docx parts), the error won’t be reported (ie docx4j’s JaxbValidationEventHandler won’t be invoked, so docx4j doesn’t have the opportunity to deal with the content error, with the result that content is silently dropped). 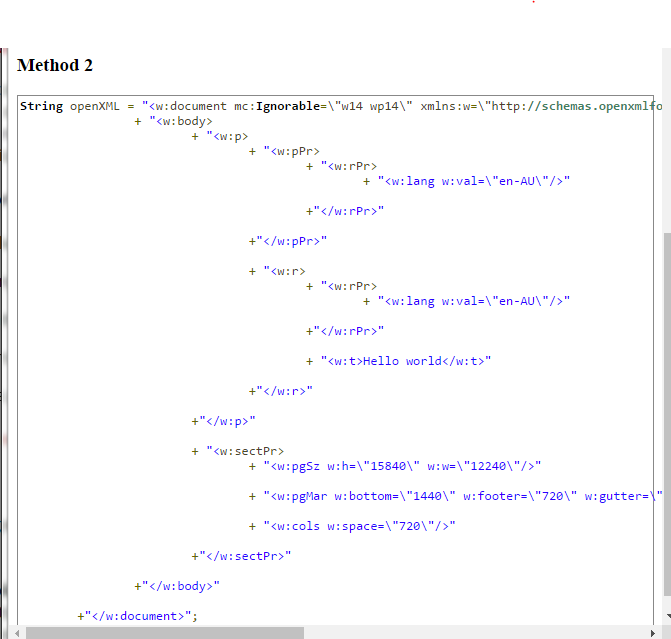 With environment WebSphere 9.0.0.4, current docx4j/Plutext releases work well. With environment: WebSphere 8.5.5.13 (WebSphere 8.5.5.9 upgraded in order to run IBM Java 8), current docx4j/Plutext releases work well. WebSphere might re-use a jar in multiple webapps. In case of unexpected results, ensure you don’t have different versions of the same jar in other webapps, stop the server, clearClassCache, and restart. If you are looking for JaxbValidationEventHandler log entries but cannot see them, double check that your jar files do not contain another log4j.xml. If you have Java 2 Security enabled in WebSphere, you will need certain permissions enabled in policy settings. So, an average of 9.8 sec per conversion (based on a range of documents, some short/quick, others long/slow). 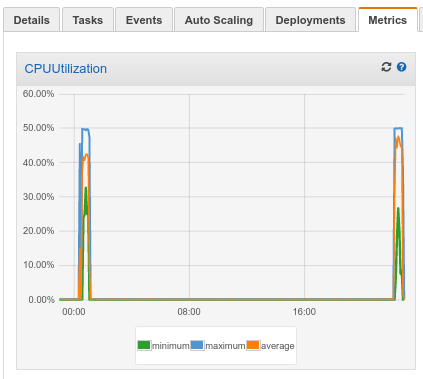 With FarGate, you can set a service to auto-scale, under CPU load or based on incoming requests. So let’s improve on those response times, by auto-scaling the number of tasks available for processing the incoming PDFs. 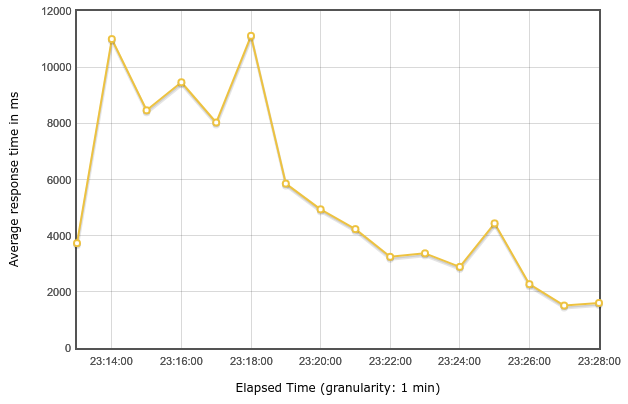 You can see the response time better than halved, and throughput doubled. (the test sarted at 23:13 and finished at 11:28; scaling in occurred some time after the test concluded). 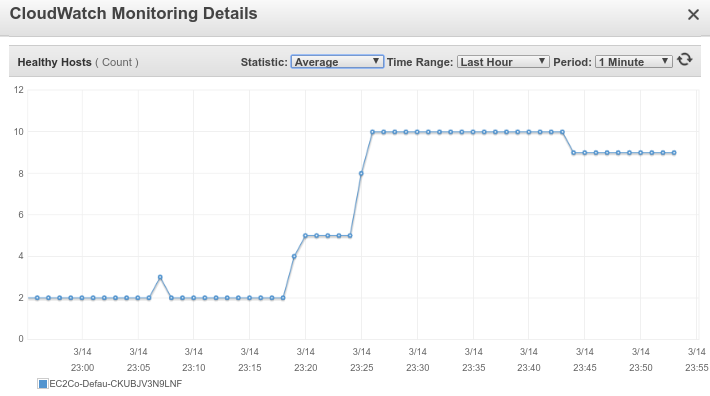 You can see from the graph below that the average response times drop as these extra tasks become available. we have an average response time of 2.2 seconds, and we’re converting 12.48 documents per second. 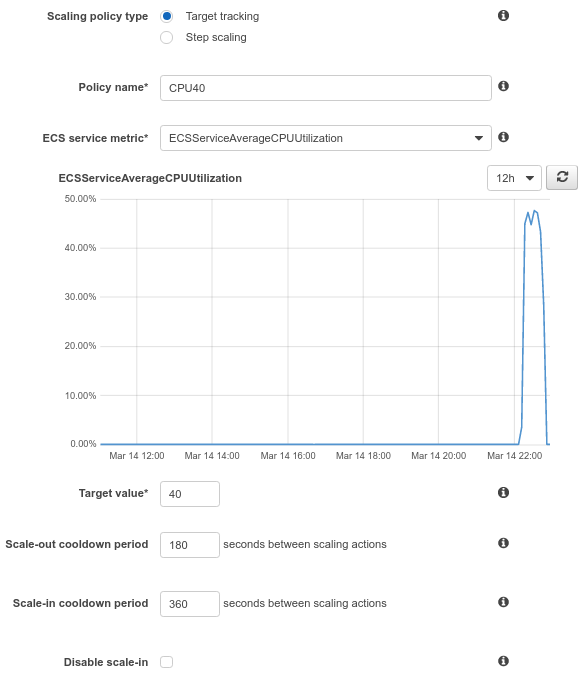 In summary, configuring the cluster so that each task has 2 vCPUs, and auto-scaling when CPU utilization hits 40%, looks like a good place to start tweaking your own instance. This is the second post in a series on scaling the PDF Converter using Amazon’s FarGate service. In the first post, we got the PDF Converter running across 2 instances behind a load balancer, in under 20 minutes. 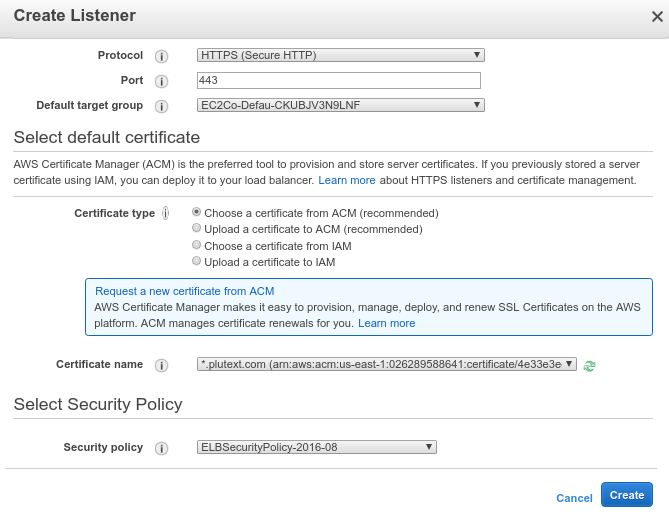 First, go to the AWS Certificate Manager (ACM): https://console.aws.amazon.com/acm/home?region=us-east-1#/firstrun/ to request a certificate (for your domain). (here I’ve used plutext.com, but obviously you’ll have substituted your own domain). If/when you click “create”, you’ll probably get a warning saying your security group doesn’t allow HTTPS, so click on the security group to allow traffic on port 443. We’re not quite there yet. If you try converting using your load balancer endpoint (something like https://EC2Co-EcsEl-1GY7BNHSDU1HTH-1150934046.us-east-1.elb.amazonaws.com:443), you’ll get an error saying the certificate subject name does not match target host name. To overcome this, you need to update your DNS records so you have a host with the right name resolving to the load balancer. The recommended way to do this is to use Amazon’s Route53 DNS. Now we know it works, you can add a CNAME record at your DNS provider, mapping your chosen host name to the load balancer’s host name. Remove the entry we added to /etc/hosts, give your CNAME entry time to propogate, then verify the curl command works. https://github.com/javaee/jaxb-v2 is JAXB’s new home (jaxb.java.net now redirects there). I’m not sure where you are supposed to get official binary releases from; Maven I guess? We’ve just published a new version of our Helper AddIn for Word; you can download it from http://www.plutext.com/dn/downloads/1472868282152/Docx4j_Helper_3-3-1-03.exe (link updated 3 Sept 2016). I’ll run through these one by one. 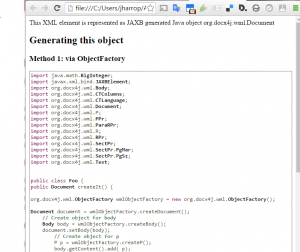 With the old version, you launched a local version of the docx4j webapp to generate code. You can still do that (click the Load Helper button, then Parts List); its a useful way to see all the parts in your docx. The “PDF” button generates a PDF. Either of your whole document, or your selection. You configure that with the “Config” button. The generated PDF will open in whatever Windows opens PDFs with for you. The idea of the “anonymise” button is to make it easy for you to email/publish a docx (or PDF) for support purposes, without giving away sensitive info. Again, if nothing is selected, it’ll do your whole docx. Otherwise, just your selection. The results will be saved to a temporary local docx (so your source docx is unaffected), then opened. If there is anything potentially sensitive the code can’t remove, it’ll let you know. Its sometimes useful to see/edit your doc defaults. Your changes will open in a new temp docx. For example, try changing font size (w:sz) from 22 to 42. 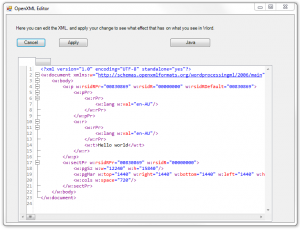 You can also make changes in Word’s Paragraph and Font dialogs by pressing the “Set as Default” button, then look here to see how that translates into XML. 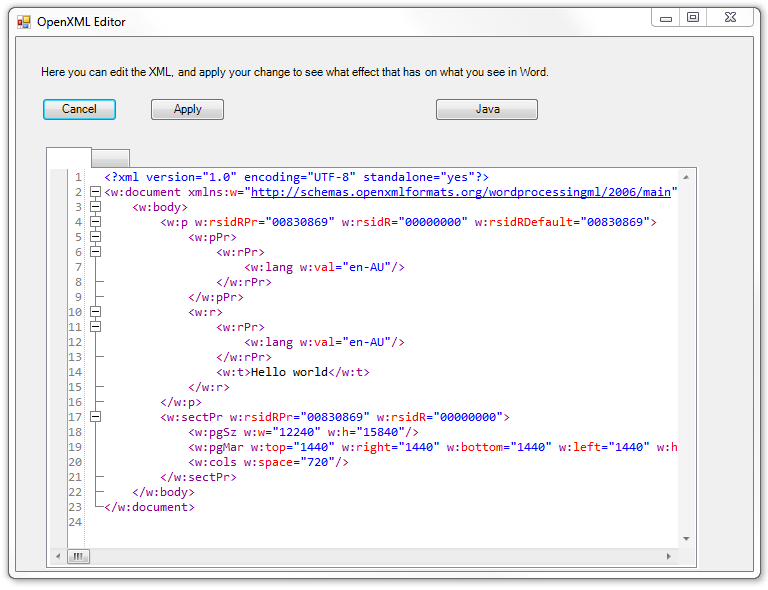 Without this, its hard to be sure whether you’ve changed your default styles, or docDefaults! Any feedback, comments, requests for new features etc, please post in http://www.docx4java.org/forums/docx4jhelper-addin-f30/ Alternatively, Plutext customers can email support.